DENVER — Before Wednesday’s game, a Giant stood in the dugout and tried to make sense of this season. He noted that it seems the team finds a different way to lose every night. On Wednesday, the Giants found a very strange way to win. Two big early rallies were built on misplays by all-world third baseman Nolan Arenado, who had — you can check the records on this one — never before had a bad moment against the Giants. Arenado’s error in the first opened the gates for two runs, and he couldn’t glove a hard shot a couple innings later, allowing two more to score on a Gorkys Hernandez single. Joe Panik took care of the rest. 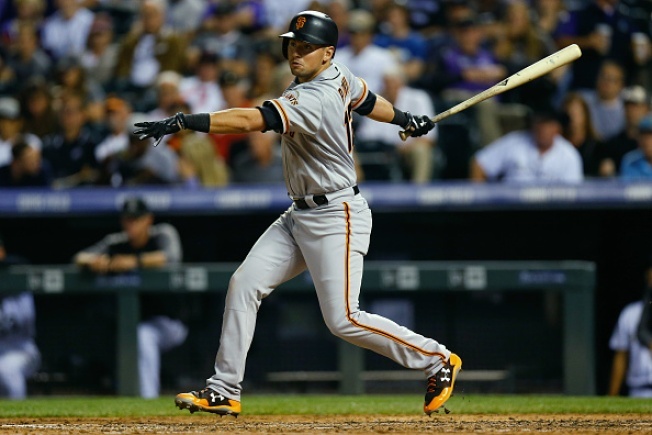 Panik had five more hits, giving him 12 for the series. Panik became the first player in franchise history to record 12 hits in a three-game series, and he did the heavy lifting in an 11-3 win over the Rockies. -- It’s possible that Panik won’t get on the flight out of town. After three hits in the opener and four on Tuesday, Panik got to five with singles up the middle in his last two at-bats Wednesday. He raised his average from .267 to .285 during the three-game series. -- Johnny Cueto brought the goods. He ended his night by blowing a high fastball past Arenado to strand a runner. Cueto gave up five hits and one earned run in five innings, striking out seven. He very much looked like the 2016 version of Johnny Cueto, which is a good sign for 2018. -- Austin Slater’s first at-bat since July 7 came in the first inning with the bases loaded and two outs. He smoked the first pitch back up the middle for a two-run single. Slater went 0-for-4 the rest of the night. -- Mac Williamson took 97 mph the other way in the seventh for a deep homer. It was the second pinch-hit homer of Williamson’s career. Maybe they should play him more? You know, see if there’s more where that came from? -- Nick Hundley tacked on with a 445-foot homer in the eighth. The blast was Hundley’s seventh. The Giants should bring him back.